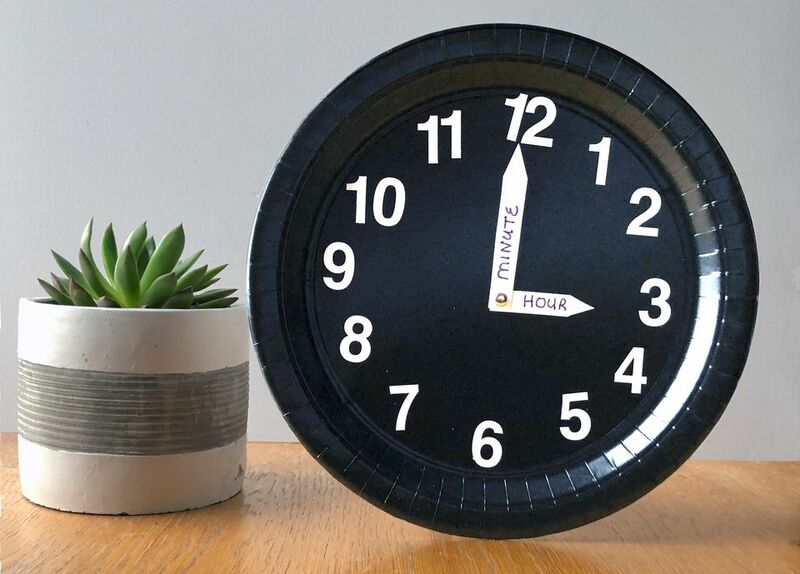 You can teach kids to tell time with this paper plate clock craft tutorial. Most children can easily understand time with digital clocks, but face a bit of a challenge learning to recognize time on an analog clock. Although digital clocks are quite popular these days, analog clocks aren't going away any time soon, and reading them is a skill a child will have to master. Help your kids stay ahead of the curve with this easy paper clock craft project, which is great to do at home or in the classroom. Before you can even start working with a paper clock, your children must understand three essential skills. They must be able to count from one to sixty. They must be able to count by fives. They must have a general understanding of time. For instance, they should know the difference between morning, noon, and night. After your child has mastered the basic counting principles, they are ready to start learning how to tell time on a paper clock. If you are using a plain white paper plate, you may paint it a color of your choice, or you can keep it white. Your kids might have fun decorating the paper plates in colors that they love. If you want to save time, skip a step and use a marker to write on the paper plates instead of using stickers. Draw the numbers 12, 3, 6, and 9 around the inner edges of your plate with a marker, then fill in the rest of the numbers. This trick will help you keep the numbers evenly spaced around the plate. You can make your paper clock fancier by placing sticker numbers from 1 to 12 around the circumference of your paper plate. Make sure to put the numbers 12, 3, 6, and 9 on the plate first, the same as if you were drawing the numbers on with a marker. Then place the rest of the numbers in the appropriate spaces around the inner edge of the paper clock. For young children who may have difficulty placing the numbers in the proper places around the face of the clock, you can write them on in pencil, and your child can match the sticker numbers up with your pencil marks, and glue them in place. Draw two rectangles on a sheet of card stock. One rectangle should be long for the minute hand and the other rectangle should be shorter for the hour hand. Cut the rectangles out with scissors. Cut a point on one short edge of each rectangle with scissors. Turn the paper plate over and mark the center of the plate with a pen, pencil, or marker. Use the sharp point of the scissors to pierce a small hole in the center of the paper plate. Pierce small holes onto the square end of your clock hands and insert the paper brad. Insert the paper brad with the hands into the middle hole on top of the paper plate and pull the brad apart on the back to secure it to the paper plate. Make sure that the brad is loose enough to allow free movement of the clock hands. To help your child distinguish the difference between the clock hands, use a marker to write minute on the long hand and hour on the shorter hand. Technically, the clock is finished at this point. We crafters, however, always have to take it a step further and put our creative mark on things! 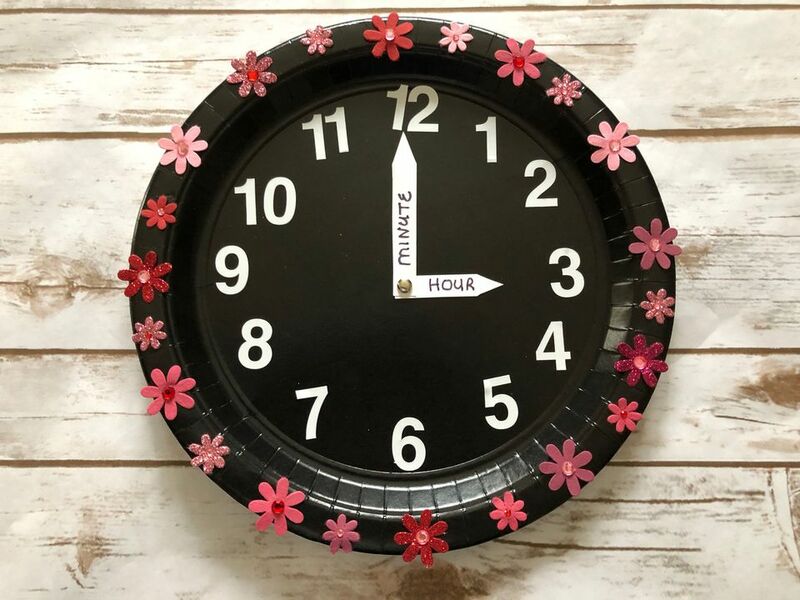 You can embellish the paper plate clock with paper flowers, buttons, washi tape, or whatever you feel like to give it some fun and pizzazz. Use your imagination to make the paper clock special while having fun with your child.